When her former governess finds happiness as the bride of a local widower, the brilliant and beautiful Emma Woodhouse -- one of Jane Austen's immortal creations -- flatters herself that she alone has secured the marriage and that she possesses a special talent for bringing lovers together. The young heiress next busies herself with finding a suitable husband for her friend and protege, Harriet Smith, setting off an entertaining sequence of comic mishaps and misunderstanding in this sparkling comedy of English-village romance. Beneath its considerable wit, the novel is also the story of a young woman's progress toward self-understanding. 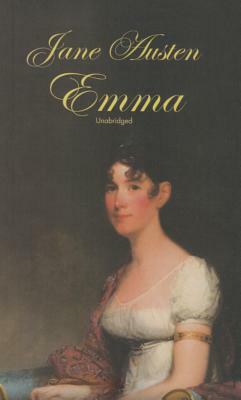 "Emma" abounds in the droll character sketches at which Jane Austen excelled. In addition to the well-intentional heroine and her hypochondriacal father, the village of Highbury during the Regency period is populated by an amusing circle of friends and family -- kindhearted but tedious Miss Bates, a chatterbox spinster; ambitious Mr. Elton, a social-climbing parson; Frank Churchill, an enigmatic Romeo; Mr. Knightley, Emma's brother-in-law and the voice of her better nature; and a cluster of other finely drawn, unforgettable personalities.